With its sweeping golden sands, enchanting pine forests and traditional mountain villages, Le Pays Basques – where France's Atlantic Coast meets the Spanish border – has long been a magnet for camping fans. And while it also boasts some of Europe’s warmest temperatures, the cooling sea breeze of this breathtaking Atlantic coastline means it’s far from arid. Campsite accommodation around here is dominated by the huge holiday parks popularised in the 1980s. Though they're affordable, well-maintained and boast plenty of stuff for the kids, they're hardly 'cool camping', dominated as they often are by colossal mobile homes, cheesy onsite discos and fit-to-bursting swimming pools. At the other end of the spectrum, some fantastic luxury campsites have sprung up in the region, boasting everything from yurts and tipis to traditional French roulettes. Unsurprisingly though, such luxury and seclusion doesn't come cheap so you should expect to be pay a fair bit for a week's family glamping break. So where lies the happy medium? The perfect blend of proper continental camping, with comfort, luxury and, above all, affordability? Well camping fans, we have seen the future. And it is dome-shaped. Geodesic dome-shaped to be precise. Glisten Camping is an innovative new holiday experience that brings some truly unique glamping accommodation to sunny south-west France. 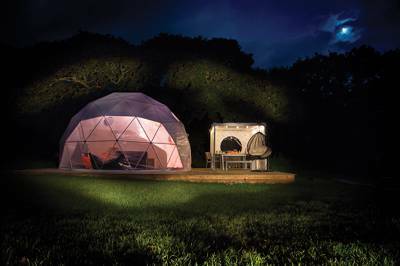 It's the brainchild of Cornish-based camping guru Simon Thomason. Like the domes themselves, the concept is simple. Simon selects the best locations in south-west France then sets up the distinctively stylish domes, which sleep a family of up to 6. The campsites' other facilities are yours to use too. So while the kids are safely off making friends, mum and dad can enjoy some of that all important peace and quiet at their space-age dwelling. The Eden Project and EPCOT aside, it's a wonder the dome design isn't used more widely today. For a time in the sixties, it looked like the hippy-vibe and counterculture notions of eco-awareness coupled with the science-faction of the Apollo moon landings would see the domed city of the future come to fruition. They're durable yet lightweight, spacious and temperate. Plus where most traditional canvas tents succumb to the stiflingly hot greenhouse effect (just ask any Bennacassim raver), the dome's flaps and solar-powered fans ensure ventilation, and keep things cool for your return. The ingenious design also minimises the need for extra materials or heavy machinery, therefore making them inexpensive and easy to construct. As Simon succinctly puts it, “the great outdoors deserve a beautiful indoors”. How right he is. Inside, the domes are a triumph of ergonomic design that would have even Kevin McCloud struggling for superlatives. These stylish pods come complete with partitioned bedrooms, king-size beds and proper mattresses, hanging beds for the kids, and ultra-comfy Fatboy bean-bags. There's also a cool yet functional ‘plancha’ gas cooker and a spacious covered al fresco dining area for those long, lazy, holiday meals. So chic are these dextrous dome-iciles, it wouldn't surprise us if the St Tropez set migrated westward along the coast for a spot of glamping. And with dome-dwellers assigned their own personal onsite concierge, every whim is catered for. There's a real thrill in staying in such futuristic-looking digs. Little ones can play Moonbase Alpha while dads will be gagging to reprise the Bruce Dern role from Silent Running. We certainly couldn't help 'duh-duh-duuuhh'ing The Crystal Maze theme tune. Ultimately, this is a comfortable, memorable family holiday from a little over £500 for a whole week (£750 in the peak August holiday period) – in short, an absolute bargain for a family holiday in sunny south-west France. And seeing these domes in their leafy campsite home, there's no denying they really are quite striking – the kind of eco-utopia the hippies dreamed of. Glisten Camping 2014 breaks start from £560 for 7 nights, rising to £750 in August, accommodation only. Short breaks available from £420. See www.glistencamping.com for more details.